"It's not that the code is some kind of exploit," Yamamoto said. "It deals with legitimate client data that every client receives, but it takes that data and converts it to a packet and sends it back to the servers, duplicating the appearance of objects and avatars. It acts like an import/export tool." I think this demonstrates how fluid notions of property are going to become. There are essentially zero variable costs of production of a digital good. You're dealing with intangible bits of information that can be copied at zero cost. In addition, copying a virtual Dell computer doesn't deprive Dell of one Dell computer, as it would in the real world. These arguments are similar to the ones revolving around filesharing mp3s except here the "victim" isn't a big corporation, but mostly individual merchants. Second Life is going to be an interesting testing ground for these new ideas to evolve since it has such a vibrant in-world economy with highly invested users. 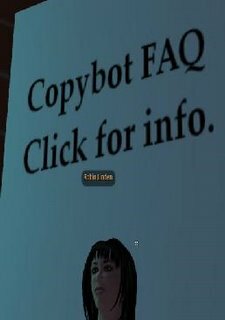 So invested that a mob of users swarmed a CopyBot vendor, shouting that she was ruining their Second Life. One user even decided to put up $3582 to buy out the would-be vendor's property in Second Life.